I can hear it now... "What? Are you serious? The Wiggles? Cool tunes for kids??? The Wiggles?????? Come on, Eric!!" It's almost become tiresome for me to keep seeing references by other kids' artists dissing The Wiggles in some way or other, or promoting their music as if it's so much cooler and better than The Wiggles. In fact, I may have seen that exact phrase on someone's CDBaby blurb - "so much cooler and better than The Wiggles." But I honestly have to wonder if these people have actually listened to the Wiggles music. And in my opinion, those claims wouldn't hold up in many cases. The Wiggles do have great music and a huge body of memorable songs that would be difficult for any kids' artist to match. I understand and agree that The Wiggles have some annoying elements of their whole package... the repetitiveness and limited humor in the interludes of their videos and shows (i.e. "Wake up, Jeff! "); the almost constant branding of their characters within their songs (at least every other song is about "wiggling" or "Wags the Dog" or "Dorothy the Dinosaur", etc. ); and the absolute proliferation of their image and logo on toys everywhere. They're a slickly marketed sell-out machine, right? No, they're just hugely successful for what they do, and deservedly so. The rest of us could only hope to have a LeapPad game based on our music and an electronic toy guitar with our face on it. But let's not let envy or jealousy make us nasty toward them, eh? I remember first hearing about The Wiggles in references to them being "The Beatles of children's music" and kind of pooh-poohing that idea. Certainly in terms of their immense popularity as a group of four guys, I couldn't disagree, but I resented that comparison in a musical sense. The Beatles created some of the greatest and most memorable pop/rock music ever. Let's not dare refer to these guys in that sense, I thought. So at first I was inclined to jump on the anti-Wiggle bandwagon and ready to think as I walked down the aisles at Walmart, "That should be me on that toy leafblower, not The Wiggles!" But the truth is that having since heard their music quite a lot (my daughters love them), I can even agree with that comparison in a musical sense. Lyrically, no. They are not writing anything with any kind of depth, as far as the words go (nor should they, for their preschool audience). But then again, a lot of early Beatles songs were pretty insipid, lyrically speaking. And The Wiggles don't have the musical complexity of some of The Beatles work in terms of the chords and structure, but they do seem to have the same innate knack for creating (yes, they do write their own songs) almost instantly memorable hooks and grooves, and they come up with some really fun riffs for many of their songs (i.e. "Zardo Zap", "The Wiggles World"). For their target audience, they offer quite a wide range of rock, pop, folk and other styles. Who else is doing such a great variety of quality music for 2 and 3 year-olds?? I don't know if the band arranges all of their own music, but the arrangements are often terrific. The piano and trumpet of "Captain Feathersword Fell Asleep" is really well built-up, the lush arrangement on "Food Food Food" is quite beautiful, and they have some interesting guitar tones on songs like "Henry's Underwater Big Band". They even have some quite involved instrumentals, like "Officer Beaple's Dance" and "Let's Have a Ceili". Some of their stuff is hit or miss, and it seems that the songs for some of their albums and videos were kind of 'cranked out', but some of their collections are really solid. 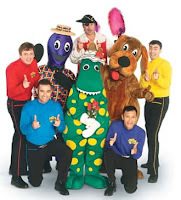 I would recommend their Toot Toot or Wiggle Time videos as good examples of The Wiggles' best music and the different styles and arrangements they offer. I've also heard good things about their live concerts, which particularly feature the comedic and vocal talents of Paul Paddick (aka Captain Feathersword). Here's a suggestion for the Wiggles dissers out there... Try imagining their songs with something else in place of the lyrics for songs like "Hot Potato" and "Captain Feathersword Fell Asleep", and tell me those wouldn't be considered the best of the best in kids' music songs. If Ralph or Justin or Trout Fishing had penned them with different lyrics and recorded them, everyone would be like, "Yeah, that's cool." The Wiggles have many great songs in that same sense. You just have to get past, or get used to, their ever-branding lyrics. And even the branding lyrics I can appreciate more than I used to... They've created a unique world for their very young audience, so why shouldn't they perpetuate that? And I have to remember that they are clearly not targeting kids older than about five, so I can't expect lyrics that are too difficult for most younger kids to pick up. There's certainly no need for me to defend The Wiggles... They seem to be doing fairly well on their own (ahem). This is more of a call out to my colleagues to lay off of them. What sense would it have been for peers of The Beatles in the 60's to publically diss them because of their popularity? Yes, I know, some of you think The Wiggles don't have any actual talent, and therefore don't deserve their popularity, but I suggest you reconsider that and give them a fair listen, especially before announcing that to the world. It sure doesn't hurt them any, but it doesn't reflect well on you to say that and gives you a heck of a standard to have to match. Are you really so much cooler and better than The Wiggles? There are several million preschoolers the world over (and at least one 37 year-old) who you'll have to convince. Don't worry, folks. There won't be a Barney post here. I can appreciate Barney for what he is and I still wouldn't dis him, but I would have a really hard time considering him 'cool' in any way. You'd be surprised at the number of adults who enjoy the Wiggles Music just as much as the kids do. I love to hear the CDs, watch the DVDs and go to the concerts. FYI the DVDs make great low impact aerobic workout videos. Great post! Thank you so much. I'm a Wiggles fan myself, as is my husband, and he has spent quite a bit of time trying to convince people that the Wiggles are good musicians. If you get a chance, catch a live show. We've been twice this summer, and they are fantastic. Even non-Wiggly parents love them. Oh, and they do nearly all their own arrangements, from the CD credits I've seen. The Wiggles helped my son with Downs get moving, when the Physical Therapist could not. They are really wonderful guys. They sometimes have the help of (blue) Anthony (and producer/director/GM Paul) Field's brother John, and mate Dominic Lindsay. These 2 fine musicians are (last I knew) in an outfit called The John Field Band. I highly recommend their first (self-titled) CD for family listening! Some of the songs have light adult content, but many are simply great to dance to! What I object to in the Wiggles is all of the marketing and exaggerated attempts to be humorous. As far as actual performances go, these guys are pretty talented. Being able to sing and dance simultaneously and vigorously requires great diaphragm control, and they don't take the easy way out by lip-synching. Still, the children's music (or rather, family social music) I like tends to be a bit more laid-back. The Wiggles are a bit overstimulating for our family. I'm learning more Wiggles songs right now to play at my daughters birthday party today. We love playing and singing wiggles songs, especially the rockin' ones. They have quite a few tunes that are quality good time rock and roll! Very catchy and well written. I believe they write their own material and as a singer/songwriter myself, I appreciate their skills as writers and performers. I hope to eventually figure out the chord changes to all of our favorites and post them on the net. There are very few available as it is. Shake your tail! Well said. I've sat down with my two toddlers many times and become frustrated trying to copy Wiggles riffs with my guitar. The songs are simple enough for my 1yr old to learn and mimic and sometimes complex enough to give me trouble.